Bailknight's Graphic Mod is undoubtedly the highest quality graphical makeover for Sins of a Solar Empire. The following screenshot will testify to that. Unfortunately, Bailknight has been gone from the forums for some time now. In his absence, I've updated this impressive mod to include the gameplay changes introduced since Entrenchment 1.02. And so I shall attempt to maintain Bailknight's work until the man himself returns. Don't forget to read the README.txt! *Note: These videos are from Bailknight's original mod, so the reduced shield effect is not shown, the broken Vasari Enforcer mesh is present, and the enhanced planet shader is not shown. Thanks for updating the best mod ever! The videos look really awesome, too. A little too much movement, but that's okay. And nice BSG music thrown in there (at least I think they're both BSG). I had Gaeta signing stuck in my head all night. Thanks so much for taking the time to fix up the files Moguta. I'm a bit busy with playing Dragon Age right now and some other things, but when I get a chance I'll get Sins and the mod installed and try to comb through it for anything you might have missed. Video looked pretty nice though. Only question I had from watching it was if starbase shield opacity should be that intense. I'll wait to see it in-game though before making any judgements. btw can anyone tell me which mod is better mansh00ters or bailknights ?? I agree with you; it seemed a bit much. However, I'll deal with it to have Bailknight's mod working on my computer again. That's not true. Manshooter's mod INCLUDES Bailknight mod so it is better than bailknight's one alone ! i'm new to the whole mod downloading thing... so i have some questions. what do i do with the file after downloading it? do i have to do anything to the file beforehand? ...Argh! It's a self-referencing loop! My belief system is shattered! I don't know what to believe anymore! You should only need to unzip the file and put it in the mod directory for the version of Sins it's to work with. In this case, I think it's something like mods_entrenchment_v1.04. Unfortunately, I don't have a computer with Sins on it at work, so I can't check for you. Sorry. what do i do if the checksums don't match? In here, you should see 6 folders from "GameInfo" to "Textures". I think you can get it working with Sins 1.05 by deleting the GameInfo folder. Note, though, that without the GameInfo folder you'll lose many changes such as the speed, frequency, and order in which with the ships' guns fire (which make a noticeable difference, especially on the TEC battleship). I'd recommend updating the game & getting Entrenchment, though. If you're stuck with Sins 1.05 because you pirated Sins, then please buy the game. It's worth it. Replays made while running Bailknight's mod will desync and crash if viewed on a regular Sins install. Is this expected? I thought the mod was just graphical and didn't affect anything else? I really like the enhanced graphics, but based on this info, it seems wise not to use the mod for anyone that plays online.....anyone else have a problem like this, or problems sync'ing on ICO? It's a different checksum from files in the GameInfo folder and different meshes in the Mesh folder. Running the mod online will always desync as far as I know. The easy way around it is to have a separate copy of the mod named differently and remove those two folders. If done right, you should have a zero checksum and most of the graphics tweaks should exist. Played some SP to test and starbase shields seem fine on my screen, so maybe it was just something with the video. That or the much larger attacks it was facing was causing a lot more shield effects to generate than I was seeing in my game. One thing that does need fixing if possible though is the Vasari Enforcer mesh. I don't remember which version of Bailknight's caused it, or if it ever was fixed, but I've seen this error before. No screenshot, but just build an Enforcer and you'll notice it right away. The texture is somehow being applied quite incorrectly to the ship model. Ok, thanks. I figured it was something like that, I just wondered because I recall people saying they were running BailKnight's online and it wasn't affecting them. I guess I will use this only when I'm playing single player. Eh, I'd still go ahead and make that separate folder for an online version of it. Removing GameInfo and Mesh really only gets rid of Manshooter's debris as I recall and a few other things like the elongated Kodiaks and Marza. Glowing missiles and all other weapon effects work just fine I believe. Then you can just enable whichever version you want on the fly. Indeed, as Mazuo said, to make the mod not affect multiplayer compatibility, you need to delete the Mesh and GameInfo folders. NOTE TO SELF: Above statement is totally something I should include in the next ReadMe. However, this does affect not only the custom meshes, but the pattern of fire & travel rate of ship weapons (all of which are determined in ships' GameInfo files). Compare the Akkan Battleship's autocannons with & without the GameInfo files, and you'll see what I mean. It's a shame that, just to change the graphical presentation, you can still end up changing files that are used to detect multiplayer compatibility. In an ideal world, everything purely related to graphical presentation would be stored seperately from gameplay-altering values. Mazuo, I recorded the video with Bloom on, which I've noticed does make hit shields glow brighter (opposed to without Bloom). Also, yes, the degree to which shields become opaque depends on the number of weapons hitting it. It's an additive effect that occurs for every weapon strike. Figured as such. It varies how noticeable it is with whatever star background you're playing on as well. Playing another game now with me as TEC vs. an AI Advent and Vasari. Going well so far with nothing really to report. I like the idea of this mod, but I feel its a bit over the top. To glowy? 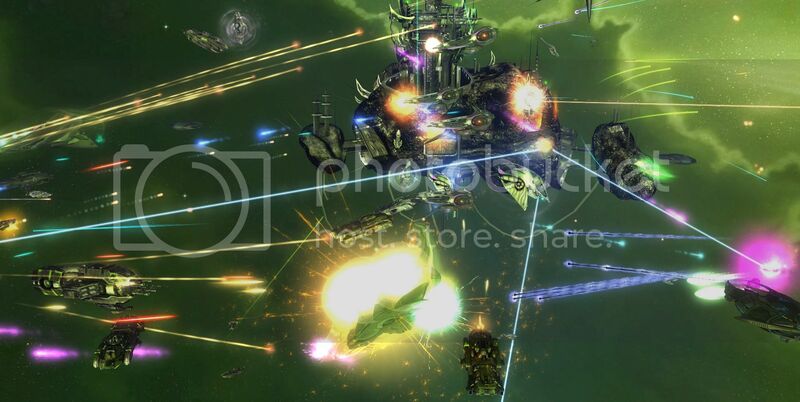 In battles you can't see whats going on due to a big mess of effects covering the ships. Wish someone with the knowhow would make a toned down version. jtillung, I completely understand where you're coming from. I used to think much the same thing. But it's a difficult balance to get just right. Make the hit effects too much smaller, and they look puny on capital ships & starbases. While where they are right now, many weapon hits look like they're momentarily engulfing the smaller frigates, it's actually not that bad. Also, the Distant Stars folks are correct that it would take changing hundreds of particle files (I can't believe how many Bailknight modifed!) to adjust everything. Thats an understatement, I worked on the Pirates weaponery effects, that took a lot of work. Found another small problem. Used to be that TEC shields glowed yellow, Vasari green, and Advent blue. All three glow yellow in my last game. Plus, could just be my eyes, but I remember little target reticules appearing on the shields where they were hit for at least TEC, and I'm not seeing them either. Let me know if you can reproduce and fix.